The fan-favorite Bristol Motor Speedway Transporter Parade is moving to the Food City 500 weekend and will see a return to its original route. 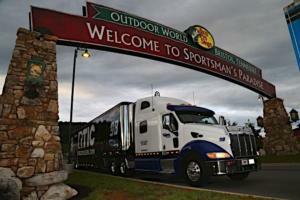 The BMS Transporter Parade is set to begin at 7 p.m. on Thursday, April 4 at the Bass Pro Shops at The Pinnacle. The haulers will then begin the nine-mile trek as night falls, passing by historic State Street in downtown Bristol as well as two Food City locations before arriving at Bristol Motor Speedway around 8 p.m.
"It was important to us to have the Transporter Parade return to its traditional route, allowing our guests the best chance to see this popular nighttime spectacle," said Jerry Caldwell, executive vice president and general manager of Bristol Motor Speedway. "When looking at our schedules, it made sense for this parade to be the Thursday night kickoff to an exciting Food City 500 weekend. We're always working for the fans and we can't wait to welcome everyone to the region in just a few weeks." Guests are encouraged to visit Bass Pro Shops at The Pinnacle to get an up close and personal look at the colorful haulers, which will be arriving throughout the day. Food City locations on Euclid Ave. in Bristol, Va. and Volunteer Parkway in Bristol, Tenn. will provide prime viewing spots as the transporters make their way to The Last Great Colosseum. A small section of grandstand near the pit gate will be open to allow guests the opportunity to see the transporters enter the Speedway and assemble in the infield. Tickets for the Food City 500 weekend are available. Food City 500 adult tickets start at $55, while tickets for the Alsco 300 NASCAR Xfinity Series/Zombie Auto 150 K&N Series doubleheader start at $35. Guests can also add on a ticket to Bush's Beans Pole Day for $10 or by bringing two cans of Bush's Beans product to a BMS ticket booth with a Food City receipt. For a limited time, $50 Food City 500 tickets are available at all Food City locations. BMS is committed to making race weekends affordable for the whole family. Kids' tickets (12-and-under) are free to the Alsco 300/Zombie Auto 150 and Bush's Beans Pole Day and only $10 for the Food City 500. Earlier this year, BMS introduced teen pricing. Teens 13-19 years old are eligible for half-priced race tickets. For all races, each child and teen must have a physical ticket in hand to enter the gates. The Bristol Motor Speedway ticket office is the only authorized location that can produce the free kids' tickets. Fans who want to get up close to on-track festivities are encouraged to add a Pre-Race Pit Stop pass to their race weekend experience. The pass provides several amenities, including a cold pass for infield access, opportunities to see the teams and haulers up close, access to the new Food City 500 pre-race party, including the pre-race concert featuring Randy Houser as well as driver intros.